Four bedroom villa with southeast-facing pool deck and two Master bedrooms on High Grove, a gated resort-style community with crazy golf course, amusement arcade, clubhouse, gym and play area for the kids, 15 minutes from the Disney parks! 14/35: Games room is full of things to do! King-size bed, ceiling fan, flatscreen TV, patio doors to the pool deck, walk-in closet. En-suite bathroom contains a shower cubicle, sink unit, WC. King-size bed, ceiling fan, flatscreen TV, walk-in closet. En-suite bathroom contains a shower cubicle, door to the pool deck, sink unit, WC. Twin beds, flatscreen TV, slide closet. En-suite bathroom shared with Bedroom 4 contains a shower over bath, sink unit, WC. Twin beds, flatscreen TV, slide closet. En-suite bathroom shared with Bedroom 3 contains a shower over bath, sink unit, WC. This four bedroom villa with southeast-facing pool deck benefits from having two Master bedrooms, both with access to the pool deck. There is also a well-equipped games room which should keep children, big and small, busy for hours! 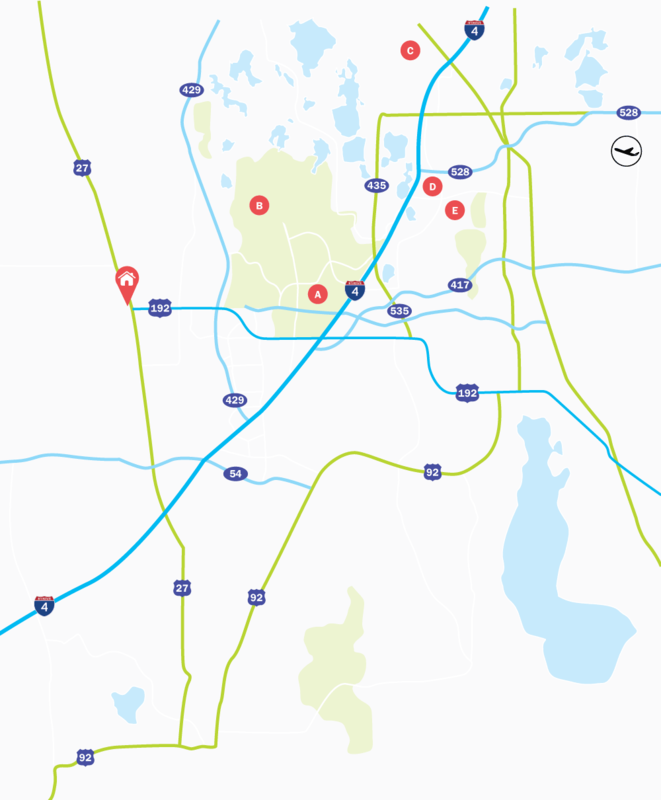 The villa is on the High Grove community in Davenport, around 15 minutes from the Disney parks, and half an hour from SeaWorld and Universal Studios, which you can reach via the I-4 highway. The community has some great resort-style facilities, including a clubhouse, gym, crazy golf course, amusement arcade and communal pool, so those who would like a change of pace on their Florida holiday can stay local and still have an unforgettable trip. For some time out in Orlando away from the parks, the US192 is lined with a fantastic selection of shops, bars and restaurants which suit all appetites. Living Accommodation - The family lounge area is at the back of the villa and has seating for six people around a wall-mounted flatscreen TV and patio doors to the pool deck. The open-plan kitchen with white appliances overlooks this and has a breakfast bar for two, as well as a dining table which can seat a further six guests. Bedrooms - Both Master bedrooms are at the rear of the villa with King-size beds, ceiling fans, doors to the pool deck and en-suite bathrooms. The pool is accessed through a door in the bedroom in the first Master bedroom, with the second Master bedroom having access through a door in its en-suite. Bedrooms 3 and 4 are both Twin rooms at the front of the villa which share an en-suite bathroom. For the convenience of the guests all bedrooms have flatscreen TVs. Outdoor Living - The southeast-facing pool deck, complete with spa, has a covered dining area where you could spend the remaining hours of your day eating and enjoying each other’s company as the sun sets. Entertainment - There is a games room which is full of fun activities to keep those with leftover energy entertained! Here you could play pool and table football as well as make use of some seating.